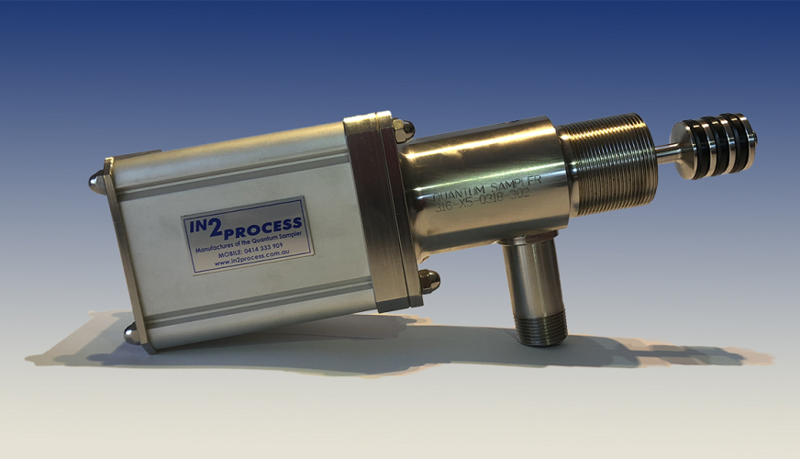 The Standard Quantum Sampling System is a “Poppet Style” Sampler for use in Slurries, Liquids and Dry Powder Streams. The Standard Quantum Sampler will take a 25cc or 50cc sample per stroke depending on which “Spool” piece is selected. The 50cc sampler is pictured above. A Standard Quantum Sampler Control System is available which is quick and easy to install and operate. However, if preferred, you can use your existing plants DCS/PLC with one of our interface boxes to control the Standard Quantum Sampler. • Easily achieves a truly representative time based composite sample of your process stream. • One moving part for easy maintenance. • With the process line isolated, a technician can “service” the sampler by changing out the process seals in less than 10 minutes! • 316 Stainless Steel with an internal hardened wear sleeve and standard XNBR process seals or EPDM and Viton process seals are available. • Other materials of construction like 904L S/S, SAF2205 S/S, Tantalum or Titanium can also be used on request.